After the resignation of Prime Minister Renzi following the constitutional referendum in December 2016, Italy is likely to hold elections this summer. Business insolvencies declined 7% in 2016 but the insolvency level is forecast to remain unchanged this year. Changes may occur based on the outcome of the elections and due to other events on the eurozone political calendar. Compared to 2016, there has been a decrease in the percentages of B2B sales on credit terms in Italy. Still, the average value of B2B sales on credit in Italy (42.5%) is higher than that registered in Western Europe (38.8%). On average, 49.9% of the sales to domestic B2B customers were transacted on credit. This is significantly higher than the percentage of sales to foreign B2B customers of 35.2%. 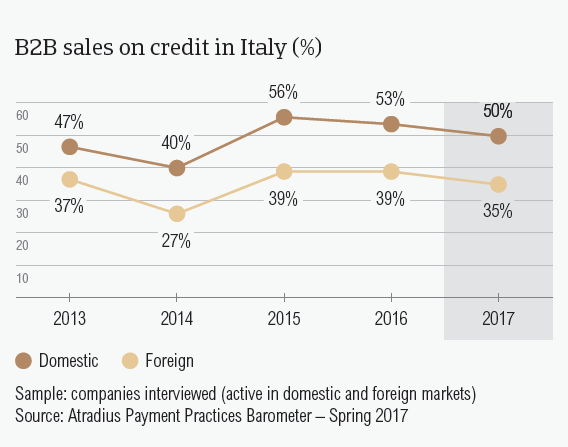 Like in previous years and consistent with the survey pattern, respondents in Italy showed a greater reluctance to sell on credit to foreign B2B customers than to domestic B2B customers. The percentages of sales on credit terms in Italy are above those of Western Europe (domestic: 42.6%; foreign: 35.1%). Compared to 2016 (domestic: 52.8%; foreign: 38.7%), both domestic and foreign B2B sales on credit in Italy dropped by almost three percentage points. This may highlight respondents’ perception that they are more exposed to the risk of payment default. 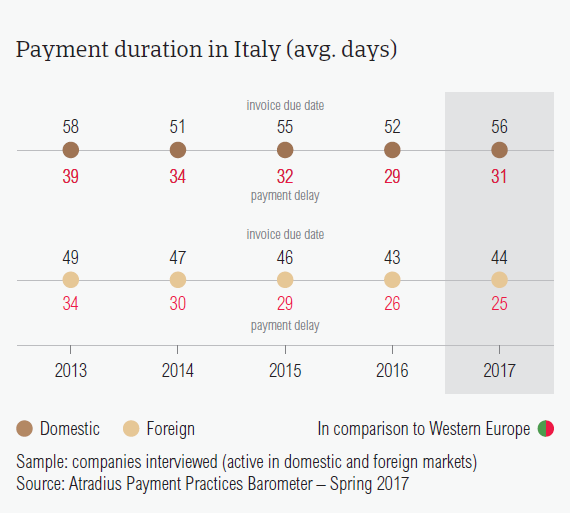 In 2017, a lower percentage of Italian respondents reported late payments than in 2016. Domestic and foreign overdue B2B invoices decreased compared to 2016 levels. 86.6% of respondents in Italy (87.8% in Western Europe) experienced late payment of invoices by B2B customers over the past year. This resulted in an average of 43% of the total value of B2B receivables remaining outstanding past the due date (41% in Western Europe). Late payment of invoices was reported by Italian respondents, most often, on domestic sales (47%). Together with Greece (52%), Ireland (51%) and Great Britain (48%), Italy is one of the countries most impacted by late payment of domestic invoices in Western Europe. Late payment of invoices (domestic and foreign) is reflected in the Days Sales Outstanding (DSO) figure posted by respondents in Italy. In 2017, this averaged 85 days and is three days longer compared to one year ago. This is almost double the annual average DSO in Western Europe (44 days) and may indicate a relatively poor performance when collecting high value invoices. Most respondents in Italy (54.4%) do not expect changes in their annual DSO. However, 22.7% expect a slight increase over the next 12 months. Despite already being some of the longest in Europe, in 2017, the average payment terms of respondents in Italy increased. Payment delays by domestic B2B customers also increased slightly. In 2017, payment terms granted by respondents in Italy averaged 50 days, two days longer compared to 2016. This is significantly above the regional average (32 days). Among the Western European countries surveyed, only Greece (54 days) has average payment terms that are more relaxed than in Italy. This may be read as an attempt of Italian businesses to offset tight financial conditions. In 2017, the average payment terms given to domestic B2B customers to settle their invoices was 56 days (up from 52 days in 2016). Despite these longer payment terms, they paid their invoices, on average, in 31 days after the due date, two days longer than one year ago. The average payment terms for foreign B2B customers also increased from 43 days in 2016 to 44 days this year. 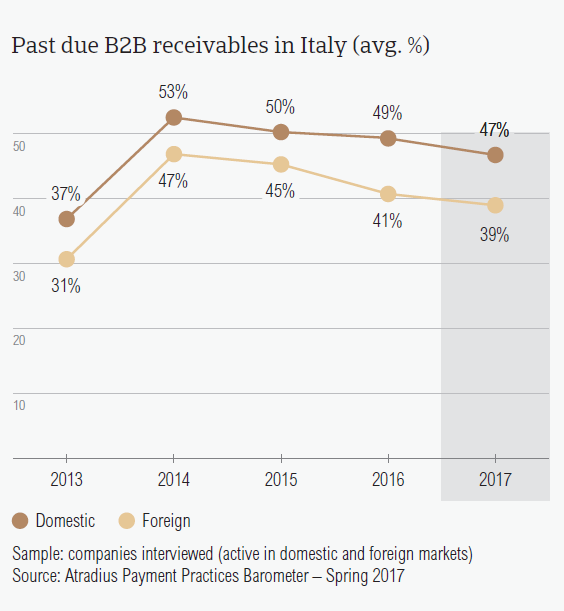 In contrast to the situation on the domestic market, foreign B2B customers of respondents in Italy paid their invoices faster, on average, 25 days after the due date. Respondents in Italy need to wait 78 days (80 days in 2016) to convert B2B credit sales into cash. Among the Western European countries surveyed, Italy had the highest percentage of respondents reporting payment delays from their domestic B2B customers due to insufficient availability of funds. 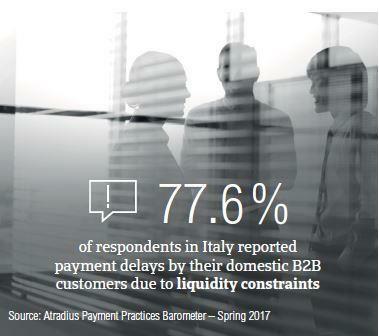 A staggering percentage of respondents in Italy (77.6%) reported payment delays by their domestic B2B customers due to liquidity constraints. This percentage is significantly higher than all other Western European countries surveyed (Western Europe average: 52.6%). The second most reported reason was buyers’ use of outstanding invoices as a form of financing (21.8%). The most frequent reasons for payment delays by foreign B2B customers were insufficient availability of funds (40.1%) and the complexity of the payment procedure (23%). As a result of late payment, 34.0% of respondents in Italy had to postpone payments to their own suppliers and 19.8% said they needed to take specific measures to correct cash flow. Compared to the regional averages of 19.8% and 18.0% respectively, respondents in Italy seem to be more affected by overdue invoices. For 18.7% of respondents in the country, payment delays resulted in lost revenues. Again, this is slightly more than the regional average, which stood at 15.3%. 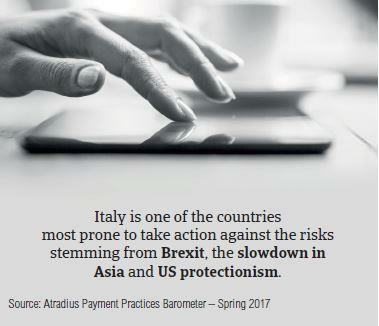 21.9% of respondents in Italy said they will take more precautions to protect their business from the potential impact of late payments stemming from Brexit, the slowdown in Asia and US protectionism. When asked about increasing protection against the potential impact of the above-mentioned developments, 44.9% of Italian respondents said that they will maintain their current mix of credit management tools. 21.9% however said that they will increase protection. Among all Western European countries surveyed, this is one of the highest percentages citing an increase in the usage of credit management tools. Similar to the responses received in Western Europe, the preferred actions are monitoring buyers’ credit risk (29.6%) and checking buyers’ creditworthiness (29.3%). To protect their businesses against the impact of Brexit, respondents in Italy plan to check their buyers’ creditworthiness (26.9%) and monitor their customers’ credit risk (25.9%) more often. The same actions were stated in regards to US protectionism (monitoring buyers’ credit risk: 35.6%, checking buyers’ creditworthiness: 33.4%). Respondents in Italy seem to be less concerned about the impact of the slowdown in Asia and a lower percentage said that they will increase protection against this. The percentage of the total value of B2B receivables reported by suppliers in Italy as being written off as uncollectable (2%) is among the highest in the region. Domestic receivables were written off as uncollectable more often than foreign receivables (domestic 1.7%, foreign 0.3%). The percentage for domestic uncollectable B2B receivables in Italy is above that of Western Europe (1%). The percentage of foreign uncollectable B2B receivables is in line with that reported at regional level. There was a decrease in the percentage of the total value of uncollectable receivables in Italy compared to last year (domestic 2%; foreign 0.4%). Uncollectable B2B receivables originated most often from the construction, consumer durables, electronics and business services sectors. 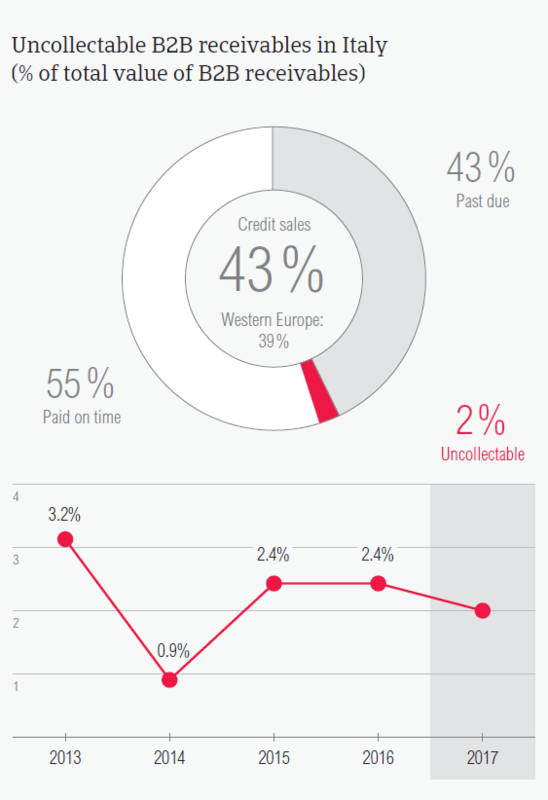 B2B receivables were reported to be uncollectable mainly because the customer went bankrupt (54%) and because of collection attempt failures (37.7%). 46% of respondents in Italy said that they expect a deterioration in the payment behaviour of their B2B customers over the coming 12 months. 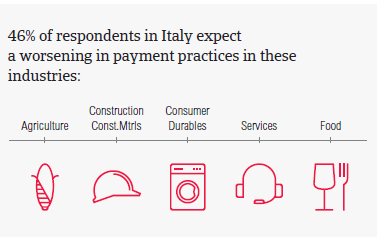 Compared to the average payment terms at country level (50 days), respondents in Italy extended notably longer payment terms to B2B customers in these sectors: construction materials (81 days), machines and textiles industries (65 days each). In 2017, the shortest payment terms were given to domestic and foreign B2B customers in the agriculture sector (36 days). Despite having almost two weeks longer to settle their overdue invoices, respondents in the machines industry generated the longest payment delays. The main reasons for payment delays in this sector were liquidity constraints (reported by 95% of respondents) and buyers using outstanding invoices as a form of financing (cited by 29%). Looking ahead, 46% of respondents in Italy said that they expect the payment behaviour of their B2B customers to worsen. This percentage is significantly higher than the regional average (26%). Only 11% of respondents in Italy believe that the payment behaviour of their B2B customers might improve over the coming 12 months.